'Tis the season for holiday treats, but if you're taking a bite of homemade cookie dough, cake mixes, or even bread, you may be putting your health at risk. The CDC is once again warning consumers to steer clear of the temptation to nibble on raw dough or batter, warning that doing so could cause infection with harmful germs such as salmonella and E. coli. But just how risky is eating raw cookie dough? 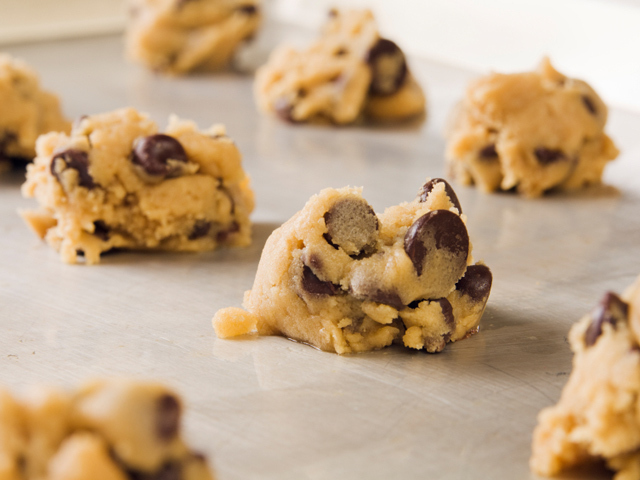 Kristi King, a senior clinical dietitian at Texas Children's Hospital, acknowledges that while not everyone who eats raw cookie dough will get sick, the risk is very real. "Raw cookie dough contains both raw agriculture and animal products, both of which can carry bacteria which may be harmful to us," she told CBS News. "If you eat raw cookie dough, it's not to say you will absolutely get sick, but you raise your risk significantly in taking that gamble." One of the major ingredients in dough, flour, typically hasn't been treated to kill harmful germs like E. coli. The grains that flour is made from can be contaminated while still in the field or at other steps as flour is produced. Cooking the flour will kill these germs but they can be present in flour's raw form. In 2016, an E. coli outbreak linked to raw flour made 63 people sick. Since flour has a long shelf life, the CDC warns people may still have the contaminated products in their home. If you have any of the recalled flour products, do not use them and throw them away. Additionally, raw eggs in cookie dough or batter can contain salmonella. While eggs are perfectly safe to eat when handled and cooked properly, they can make you sick if the eggs are contaminated and are eaten raw or lightly cooked. According to the CDC, each year 48 million people in the U.S. get sick from a foodborne illness, 128,000 are hospitalized, and 3,000 die. While there is not a breakdown of how many of these illnesses are caused by people eating raw cookie dough, the symptoms aren't pleasant. "Flour is a known culprit for carrying E. coli in which symptoms may appear three to four days after consuming the product and can result in fever, cramping, bloody diarrhea, and vomiting," King said. "Raw eggs are known for carrying salmonella and this bug tends to be more quick-acting, usually six to 48 hours after consumption, and results in cramping, fever, and diarrhea. In some cases, foodborne illnesses can lead to death." Children, especially those under the age of 5, older adults, and those with weakened immune systems due to medical conditions are at a heightened risk of complications and death from food poisoning. In order to avoid illness, experts recommend not eating raw dough or batter — no matter how tempting it may be. "It's the holiday season, we all have places to go and people to see and don't want to be stuck at home ill, so just say 'no' to the dough and eat the baked good instead," King said. Clean up thoroughly after handling flour, eggs, or raw dough by washing your hands thoroughly and washing bowls, utensils, countertops, and other surfaces with warm, soapy water.